After quite a while of not adding any new Apple systems to my collection I spotted this system on eBay in November 2004 and ended up getting it for AU$50. I think this was a very good deal as it came with an additional 128MB of RAM, for a total of 160MB, and a couple of cartridges for the 135mb SyQuest EZiDrive. The front of the system unit. 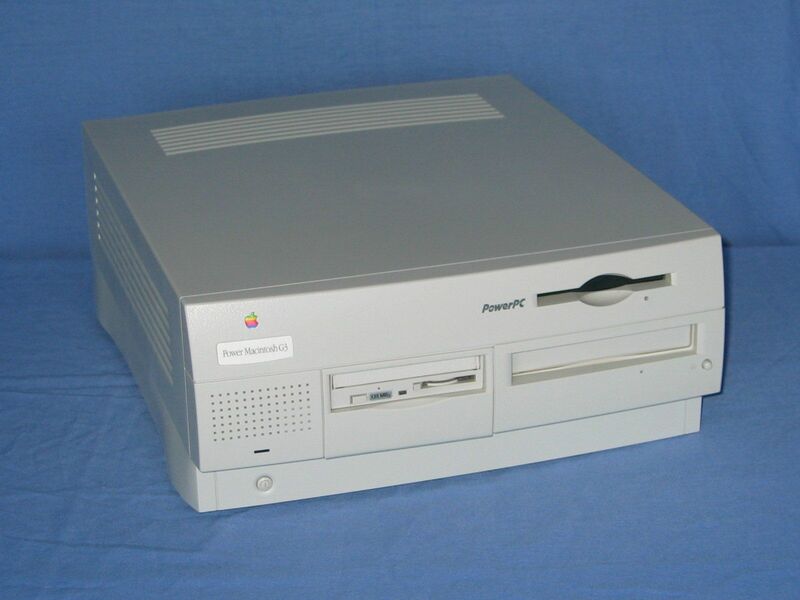 Apart from the name on the sticker under the Apple logo there is no apparent difference between this and the Powermac 7200 I also have as they both, and others, use the same chassis design. 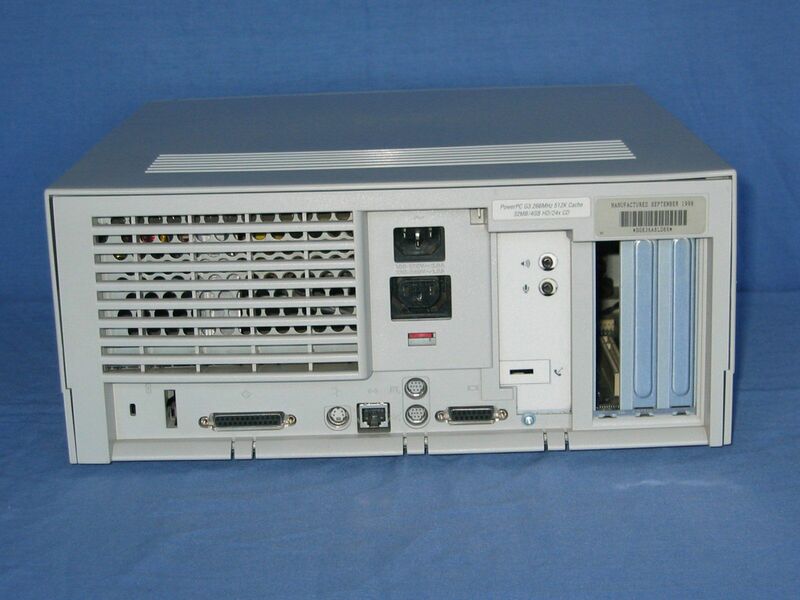 This system also has a 135MB SyQuest EZiDrive. There is not much to see on the back of the system except for the area to the right of the power sockets that signifigantly varies based on what type of personality card the system has. 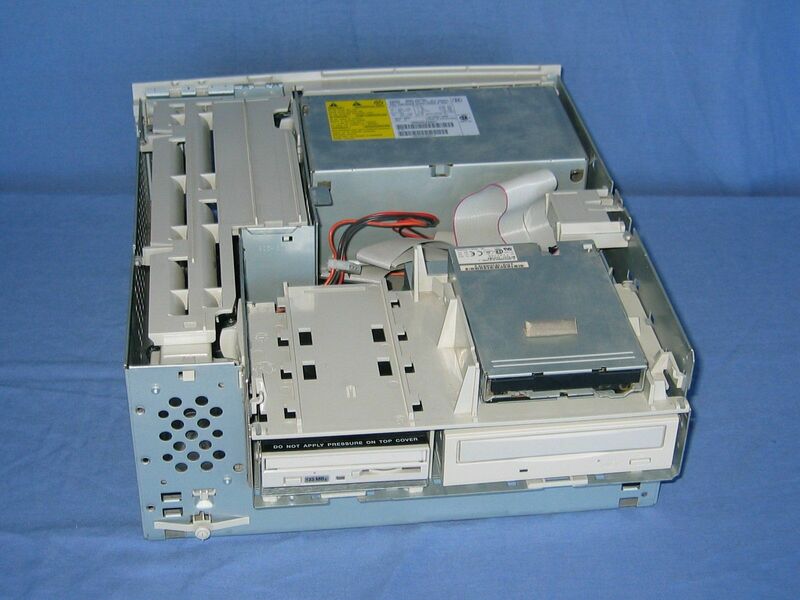 Even after removing the cover the possible area of concern for someone familiar with the earlier models that used this chassis design is the lack of a hard drive in the top bay. What isn't shown is that the CD-ROM is now IDE instead of SCSI. 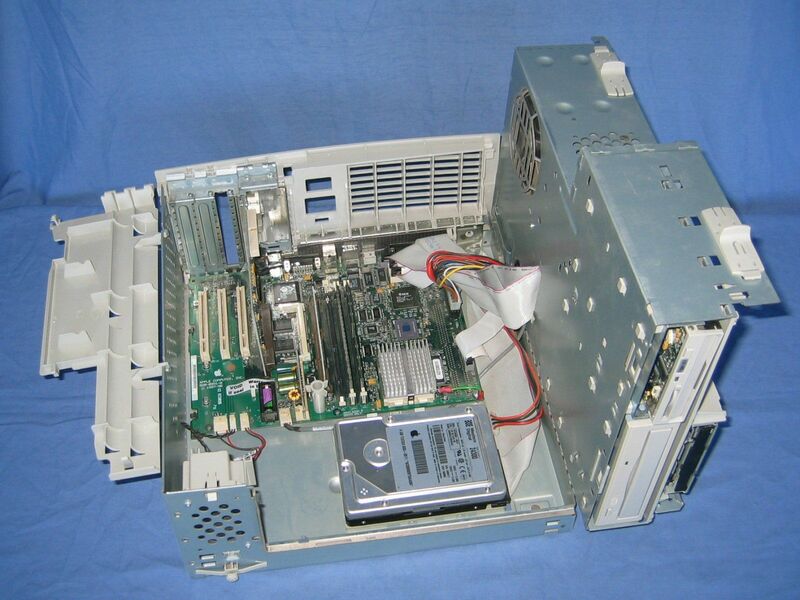 It is only once you get down to this level that there is any obvious differences between this and earlier models, the motherboard is around about two thirds the size which leaves ample room for a hard drive. The personality card in this system only provides headphone and microphone sockets. Not the full complement of audio and visual connections that were available. The slot visible near the base of the card is for a modem. An overview of the motherboard. 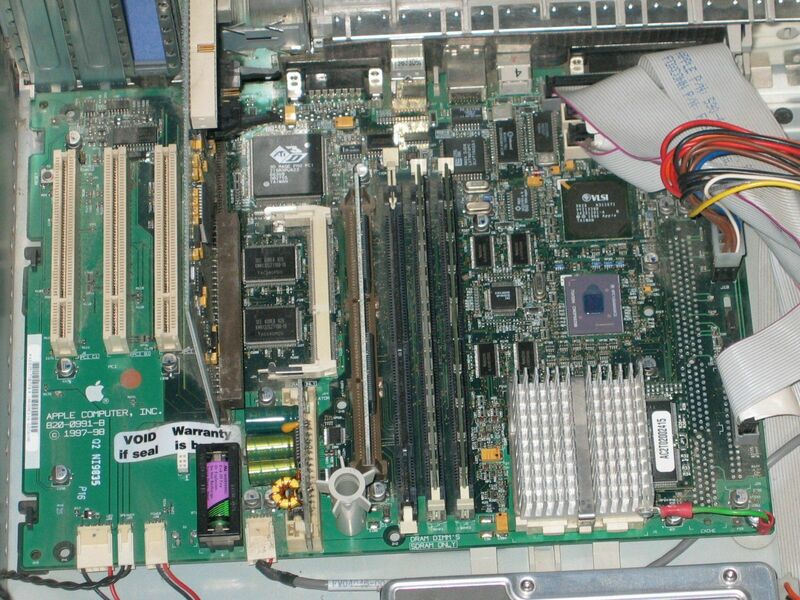 From the left are three PCI slots, the personality card in its slot, a SO-DIMM like socket for video ram, the ROM in its slot and two of the three SDRAM slots populated. 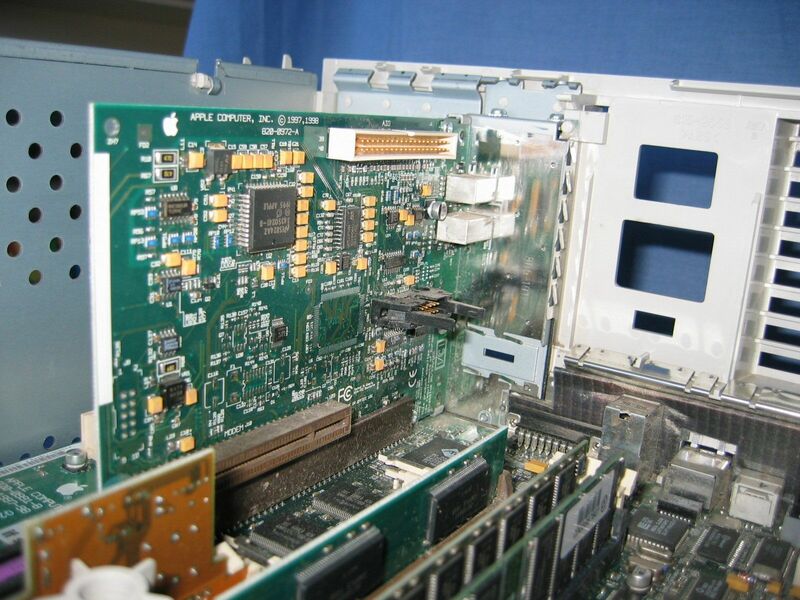 At the top right is the SCSI socket and two IDE channel sockets.